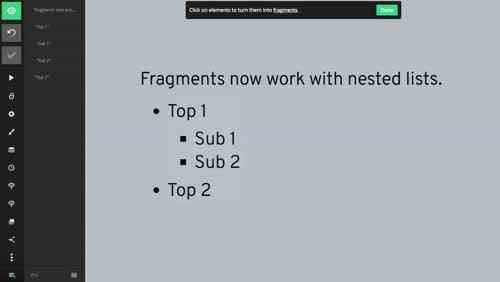 Fragments are steps within a slide that can be used to reveal content incrementally. Now we've made them even easier to use. Take a look at the new sidebar for managing fragments. The sidebar is great for nested lists. We've also added new options for previewing and clearing all fragments. We've added new fragment styles. Fragments now play nicer with PDF exports. Each fragment is exported on its own page, so that the step-by-step reveal isn't lost. Sign in to give it a try! If you're not already a member, sign up for free. 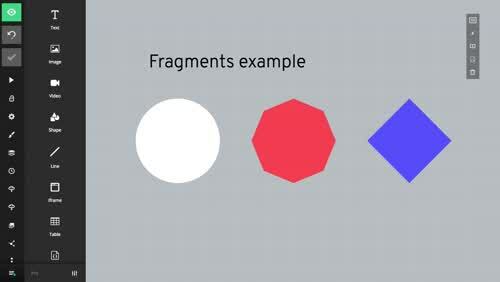 Fragments allow you to reveal a slide in multiple steps. 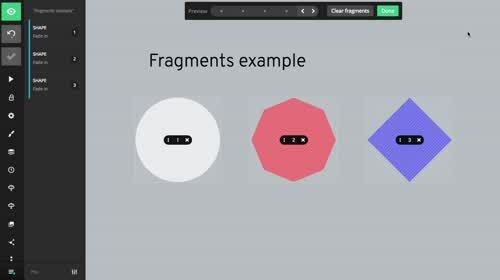 We have redesigned the fragments interface to make them more powerful than ever and even easier to use.